Before I start this post, I want to say that I personally don’t wear fur but I do wear leather and eat meat. Fur is a very emotive issue and if you were to walk down the street in the UK wearing a mink or rabbit fur coat you could expect at best a few stares and muttered comments and at worse a full-blown verbal attack or more. I asked a few UK friends if they would be shocked to see a trendy twentysomething wearing a rabbit fur coat and the answer was a unanimous yes. With ‘celebrities’ such as Kim Kardashian proudly wearing fur, the issue is very much in the public eye at the moment, with many people on social media attacking her choice. When I first moved to Copenhagen I must admit I was shocked to see women of all ages wearing new fur coats (not vintage). You get the Copenhagen matriarchs in their long glossy classic numbers, younger women in trendier versions and many home-grown chain shops selling rabbit fur gilets. In fact to get the accompanying photo for this post, I simply walked down my local shopping street and immediately found a little boutique selling a raccoon fur jacket. There are fur shops on Strøget and in the Christmas markets it is easy to find a rabbit fur hat. 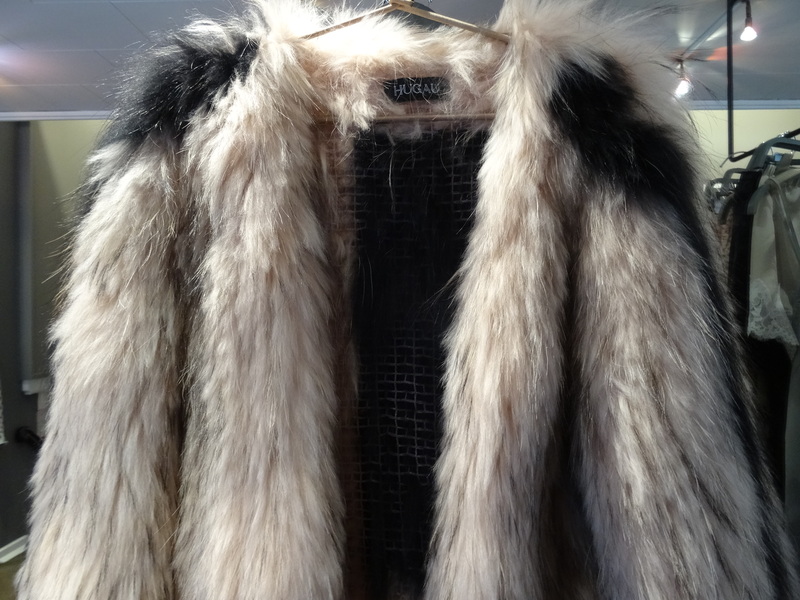 In fact fur is one of Denmark’s biggest export products. Denmark has 1500 mink farmers who produce almost a fifth of the world supply of mink furs. After skinning, the rest of the mink is then used as biofuel. Along with pig farms, it is a pretty discrete industry. Glostrup is the home of Kopenhagen Fur and a huge fur auction house, popular mainly with Chinese buyers to the extent the location has signs in Chinese and a Chinese restaurant on site. A few years ago Kopenhagen Fur took out a huge ad campaign at the airport and also sponsored Tivoli, much to the shock of an expat here as she thought the connection between a family venue and the fur trade was wrong. Why are Danes ambivalent to the wearing of fur? I did a little research on the subject and the word that came up was ‘inured’. Danes are generally inured to animal rights and foreign activists haven’t really discover Denmark. I suppose this inure comes across in other areas; many people hunt here and don’t make a secret of it, free range meat isn’t that easy to find in the supermarkets, you can travel across Jutland, the main pig farming area of the country and not see one pig despite the fact there are more pigs here than humans. Danes have a pretty practical mentality and I guess most see farmed animals as a fact of life regardless of the purpose of the farming. I like that you touch this hot iron. I have noticed that fur is back. Either small pieces of fur on coats or gloves in the Wintertime or full blown coats. I also noticed the: “I don’t care attitude” that goes along with wearing that. I have met some women who said: Well the animal is dead, we are not doing anybody a favour if we keep it in the closet. Than we can wear it too. I cannot bring myself to wear it..